Lenovo’s user and customer experience teams gather feedback from millions of people to better understand what they need, and want, in their next portable PC. It’s these consumer trends and insights that led to the development of the new Miix 720 Windows detachable – an all-purpose digital vehicle with state-of-the-art components that not so much blur as altogether eradicate the lines separating today’s work hard, play hard mentality. 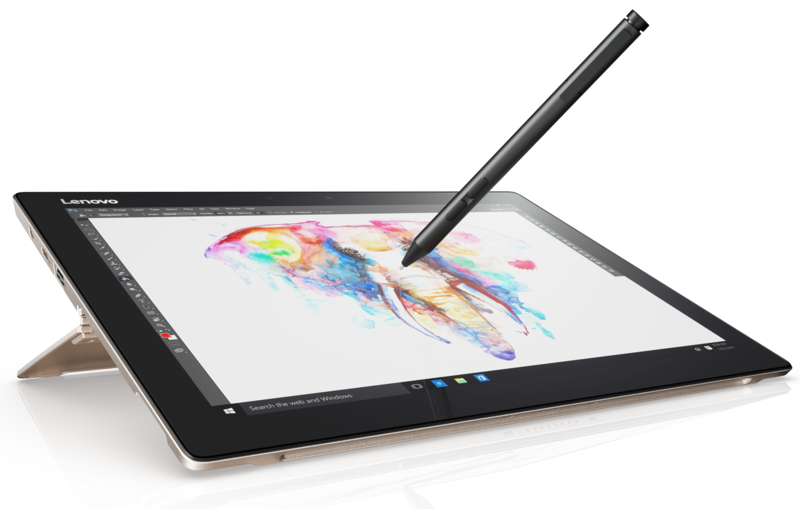 With one-third of millennials prioritizing device flexibility and work mobility over other work perks, including salary, the Miix 720 is tailor-made for the “work from anywhere” user. Your alarm goes off and like nearly 40 percent of the U.S. workforce, you may be working remotely for part of the day due to a high-stakes mid-morning presentation that you’ll be giving to a key prospect. You take a seat and flip open the screen for a final review of the deck. The Miix 720’s integrated infrared (IR) camera with Windows Hello instantly recognizes your face to unlock the detachable. No more obtuse, difficult-to-remember, easy-to-mistype passwords that will unnecessarily delay the start of your workday. You’re grateful for the ease and agree with the 75 percent of PC users surveyed who think PC bio-authentication, like the Miix 720’s facial recognition, is a highly convenient and appealing feature. With the Lenovo Active Pen 2 in hand, you use the shortcut button to open your email and check for any last-minute edits from your boss. Her suggestion: add one more hand-drawn schematic to the presentation. As part of the over 20 percent of detachable users surveyed who use a pen or stylus on a daily basis, you rely on a digital pen to sketch out the drawing along with some supporting annotations with just the click of your Lenovo Active Pen 2 using Windows Ink™. The 4,096 levels of pressure sensitivity on the pen offer a precise drawing experience, like writing on paper. Like most of us, the process of drawing and writing with a pen helps you frame content in a way that makes it more memorable and meaningful. Lenovo’s commitment to creating smarter pens is based in large part on a growing body of research demonstrating that digital pens are better suited to intrinsic human cognition, including conceptualizing, prototyping, sketching, memorizing, and good old-fashioned brainstorming. In other words, not only are you not worried about this last-minute addition, you’ve already got the new information incorporated into the pitch and understand precisely why it’s there. You add the new slide to the deck and use Wi-Fi to fire the updated presentation off to your boss. All of this and your coffee is still hot. Your detachable’s up to 8-hour battery life with a USB connection that never sleeps means you can even charge your smartphone while your Miix 720 is powered off, as you finish your coffee. When you get to the client’s office, you simply connect the conference room’s 4K monitor to the Miix 720 via Thunderbolt™ 3, the fastest port available on a PC today. At 40Gbps, Thunderbolt 3 can handle all of your data transfer needs along with a simultaneous video conference feed with the boss. The presentation is a hit, the deal is secured, and you once more break out the Lenovo Active Pen 2 to create a digital signature on the contract. Losing the stylus is the number one problem amongst digital pen users, but you have no trouble locating your Lenovo Active Pen 2 thanks to a convenient pen holder designed for the Miix 720. Back in your own office, you attach the full-size keyboard which boasts 1.5mm of key travel for faster, more accurate typing and alternate between email and word processing for two new proposals before heading to a new product presentation. During the meeting, you again detach the touchscreen and use your mobile tablet and Lenovo Active Pen 2 to easily take notes. Before exiting the room you snap some photos of the presenter’s whiteboard notes with the Miix 720’s integrated camera. En route home after a long day, you’re inspired by the outdoor scenery for your next prospective pitch. Because creativity doesn’t wait, and thanks to the Miix 720, you quickly snap some images on its rear-facing 5MP camera and spend the train ride home editing the image with Lenovo Active Pen 2. Better yet, its integrated Thunderbolt 3 and optional connectors lets you connect up to two displays at vivid 4K resolution for the times you want to watch movies with family and friends. Join Lenovo on LinkedIn, follow on Facebook or Twitter (@Lenovo) or visit at www.lenovo.com.